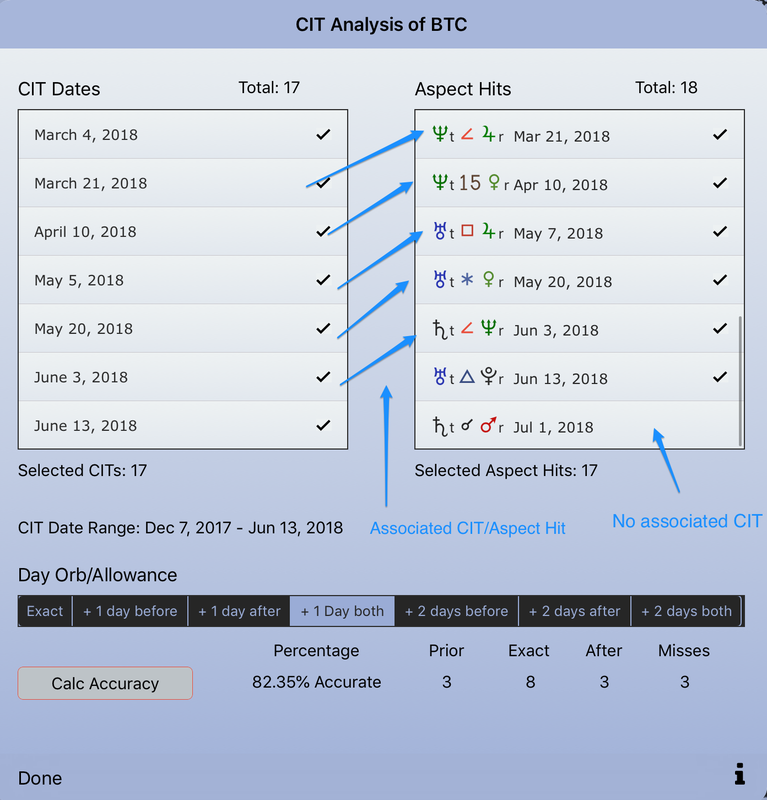 Tab 1: Analysis of Aspects Hit dates to the radix compared to the actual CIT date. To determine accuracy. Tab 2: Missing Aspects when there is a significant CIT. 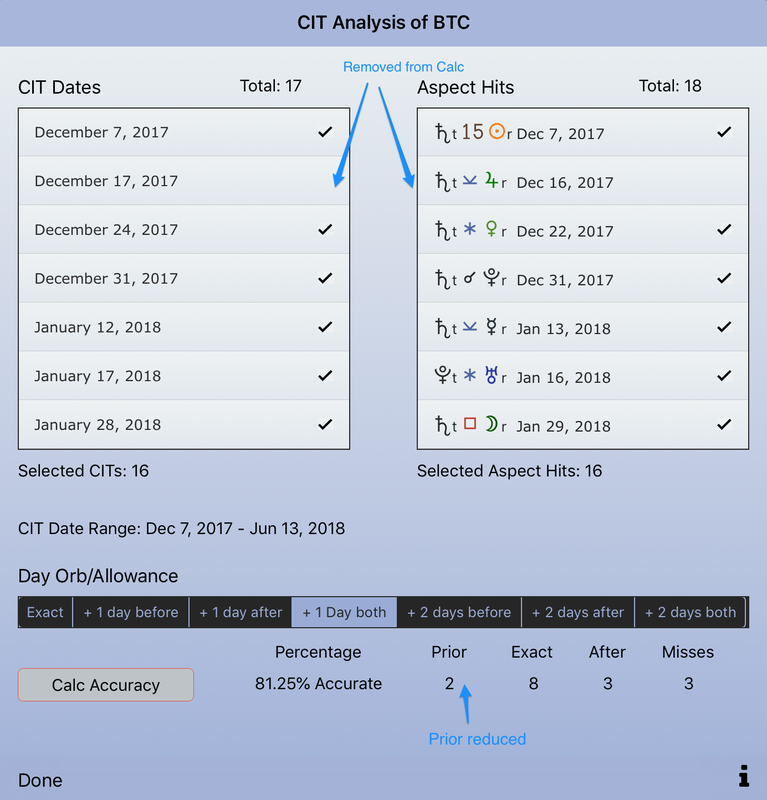 CIT Analysis, and Add a CIT – see screenshots below. A new table for the added CITs. Automatically populated when adding a CIT. Records identified by the stock or crypto currency. 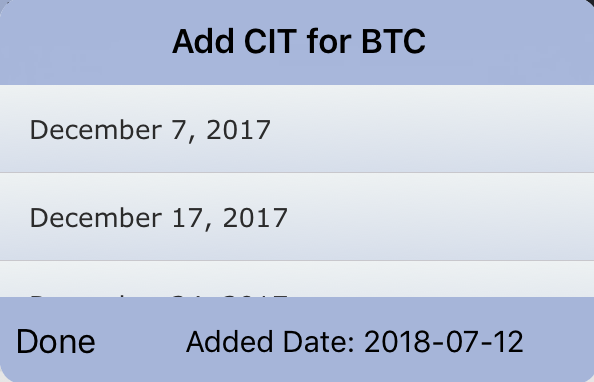 CIT’s for BTC are provided for the date range Dec 7th 2017 to June 13th 2018 – automatically provided on AC install or update. Requirements: Aspect Hit data, and CIT data. Procedure: Using Aspect Hits data produce some simple stats. 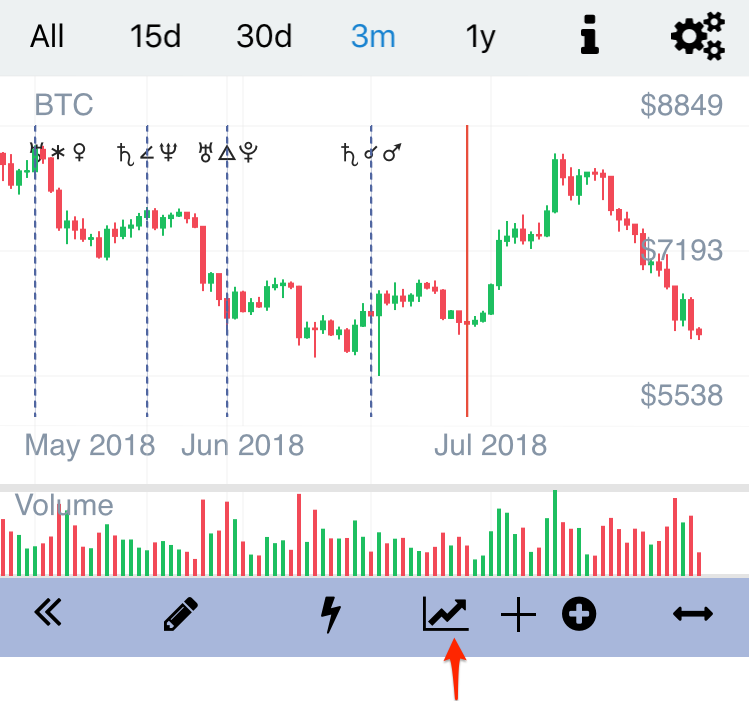 For example Bitcoin exact aspects to the Radix and compare these dates to the actual associated Changes in Trend (CIT) date of the Bitcoin price. Removing (un-tick) an Aspect Hit from the calculation. Long-press over the financial chart and select an actual CIT date to compare with an associated Aspect Hit date. Release long-press. Tap the + button icon. 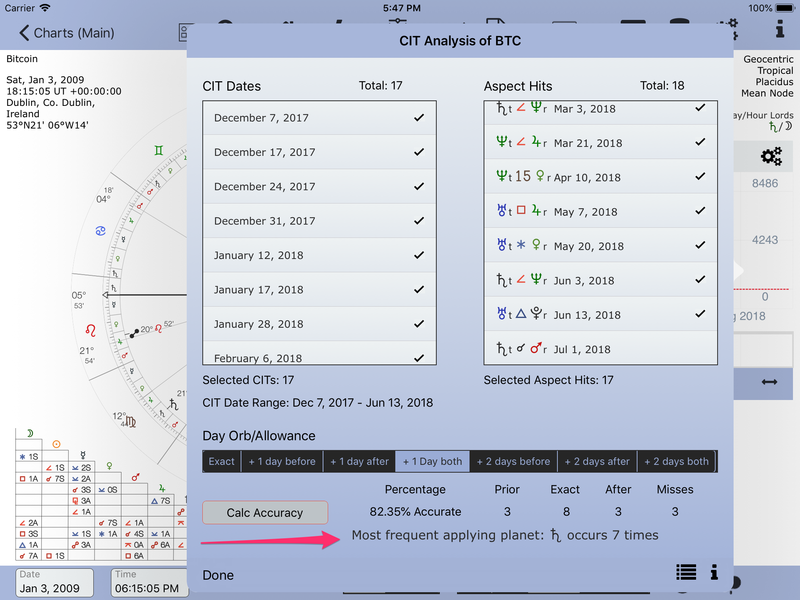 The CIT Date table is shown above the financial chart and the date is added to the table. The time is ignored. View the results in the Analysis form. The CIT dates will always be shown in date order. When adding dates duplicate dates are ignored. You can swipe to delete a date record. 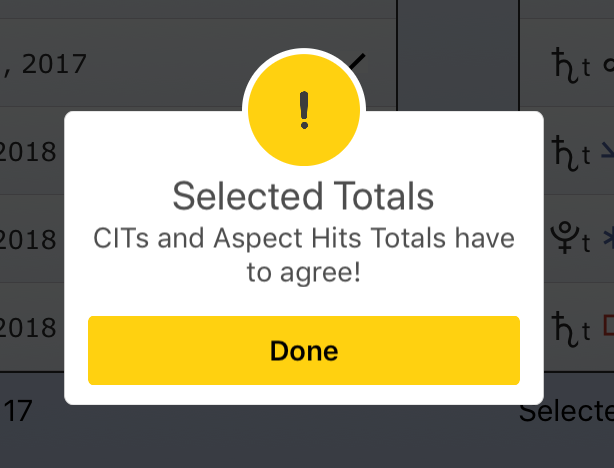 Ensure that the selected CIT and Selected Aspect Hit totals are the same. Please note this is a basic and simple analysis. Various factors are not taken into account. Such as: is the CIT significant? Are there two aspects happening at the same time that seemingly interfere with each other and cause the CIT to be less significant that could be hoped for. 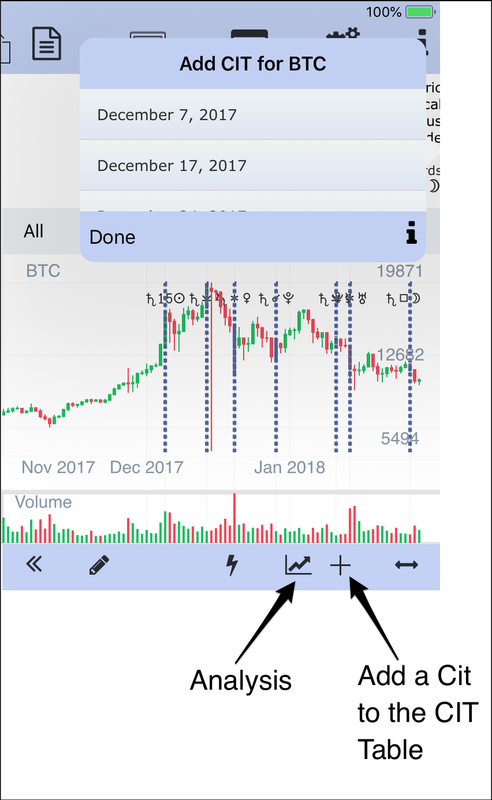 However, I believe that the analysis does give a broad indication of the effectiveness of using Transits to the BTC radix to signify a change in trend (before it happens). This may not apply to other financial instruments.